Reed SG, Duthie MS. 18 September 2016, posting date. Vaccines for prevention of leprosy. In Scollard DM, Gillis TP (ed), International textbook of leprosy. www.internationaltextbookofleprosy.org. At the extreme multibacillary (MB) pole, lepromatous leprosy (LL) patients demonstrate high titers of anti-M. leprae antibodies but an absence of specific cell-mediated immunity . In the absence of a strong cellular immune response, LL patients do not control bacterial replication and have high bacterial indices (BI). In marked contrast, paucibacillary (PB) leprosy patients, encompassing the borderline tuberculoid (BT) and true tuberculoid (TT) forms, are characterized as having one or few skin lesions and granulomatous dermatopathology with a low or absent BI. PB patients demonstrate a specific cell-mediated immunity against M. leprae and have an absent, or low, BI. Control of bacterial growth by PB patients indicates that these individuals mount a strong immune response against M. leprae. Although not necessarily curative, the potent antigen-specific T-cell responses of PB patients can inform a reverse vaccinology approach to identify key targets of an immune response that limits and restricts M. leprae. Further support for this strategy is derived from the observation that many healthy contacts of leprosy patients exhibit antigen-specific inflammatory responses. Indeed, M. leprae infection does not always cause disease; it is estimated that up to 90% of infections may resolve naturally without causing disease symptoms , . However, as is the case with tuberculosis, the percentage of infected individuals who do not limit their infection still comprise a large number, hence the need for a vaccine. The vaccine candidates developed or attempted thus far have consisted almost exclusively of whole mycobacteria (Table 1). Due to the inability to produce M. leprae in culture, several of the vaccine candidates have consisted of heterologous mycobacterial species. Setia and colleagues selected all experimental and observational studies in their meta-analysis following restriction to studies that measured the protective effect of BCG alone, with the efficacy of BCG determined as prevention of clinical leprosy (defined according to clinical and/or microscopic criteria). Studies that measured the protective effect of BCG combined with other treatments were excluded. Merle and colleagues selected only controlled trials with a clearly defined placebo (or nonintervention) group. Case-control studies had to define the criteria for selecting cases and controls, as well as the method for determining their BCG vaccination status, to be selected for their analysis. Although the BCG vaccine was introduced as a tuberculosis (TB) vaccine in 1921, BCG immunization has been recognized to contribute to protection against leprosy . As with TB, the protection afforded against leprosy by BCG vaccination is highest in younger individuals and wanes over time , , . Systematic meta-analyses indicate that BCG has a protective efficacy of around 50%, and that protection appears to be better against the MB than PB forms , , although the degree of protection against leprosy has varied dramatically. The reason for the wide-ranging protection percentages reported across studies is unclear, but BCG vaccines have never been standardized and thus the use of different vaccine strains may be a contributing factor . Computer modeling, based on the 2003 leprosy situation in hyper-endemic districts of Bangladesh, suggests that the incidence of leprosy would be substantially reduced by good BCG vaccine coverage of infants and the combined strategies of contact tracing, early diagnosis, and treatment of infection and/or chemoprophylaxis among healthy household contacts (HHC) . Some countries have implemented re-immunization of leprosy patients with BCG as common practice and some studies indicate that multiple BCG vaccinations can enhance protection , , although such a strategy has not been effective against TB , , , and WHO guidelines do not support BCG revaccination. Furthermore, it has been reported that BCG inoculation may accelerate the onset of PB leprosy , . So, while this approach is debated , , , , BCG remains the only vaccine widely administered for the prevention of leprosy. The vaccine potential of killed M. leprae obtained from the lesions of armadillos also has been assessed. Between 1983 and 1991, the efficacy of BCG with and without killed M. leprae was evaluated in Venezuela , although a five-year follow-up indicated that comparable numbers of leprosy cases emerged among individuals vaccinated with BCG alone and those vaccinated with BCG plus irradiated, autoclaved M. leprae. Similar findings were reported in Karonga, in northern Malawi . By six to nine years after vaccination, the incidence rate of all new leprosy cases, across all ages, was significantly lower among the BCG recipients than among those who received a placebo, without enhancement by the addition of M. leprae. Conflicting data were generated in a trial in south India , where it was reported that BCG/M. leprae provided 64% protection whereas BCG alone provided 34% protection. The reason for this discrepancy versus the earlier observations in Venezuela and Malawi is unclear, but whatever the reason, it is clear that developing an effective and sustainable vaccine that depends on preparations from armadillo lesions is a dead-end approach. Several cultivatable mycobacteria have been evaluated as alternate leprosy vaccines. In the aforementioned south India trial, an additional group of recruits was immunized with the Mycobacterium w, reported to provide protection in mice , , . Follow-up evaluations indicated that M. w provided only 25.7% protection, lower than all other groups evaluated. Despite this, a large-scale, double-blind immunoprophylactic trial of a M. w vaccine was conducted in index cases and their household contacts in Uttar Pradesh, India, between 1992 and 2001. The vaccine consisted of 1 x 109 heat-killed M. w bacilli for the first dose and a second, half dose given six months later . When index cases alone were vaccinated, protective efficacies of 43%, 31%, and 3% were reported after three, six, and nine years, respectively. When contacts alone were vaccinated, protective efficacies of 69%, 59%, and 39% were observed. When combined patients and contacts were vaccinated, the protective efficacy was 68%, 60%, and 28%. As with other studies, the vaccine efficacy was highest in children. Thus, the protective effect of the M. w vaccine was sustained in Uttar Pradesh for a period of about seven to eight years. Despite the reporting of these results in 2005, and commercial availability as “Immuvac” vaccine, M. w does not appear to have been evaluated in other leprosy-endemic regions and has not emerged as a common control or prevention strategy for leprosy. ICRC bacilli, which are cultivable mycobacteria of questionable origin, probably belonging to the M. avium intracellulare complex, were also used in the south India trial as a live vaccine , following reported use of this vaccine candidate to protect mice , . ICRC immunization induced persistent lepromin conversion in LL patients, as well as induced lepromin conversion in previously negative healthy subjects . Of all the immunization groups included in the south India trial, ICRC provided the best protection, at 65.5%. Thus, the south India trial indicated that the ICRC vaccine might be useful for the control of leprosy. However, again, the widespread use of ICRC for the prevention of leprosy has not been reported. Mycobacterium vaccae is a nonpathogenic species of the mycobacteria that lives naturally in soil. A trial conducted in Vietnam involving vaccination with killed M. vaccae alone (108 bacteria), BCG alone, or BCG plus 107 killed M. vaccae enrolled children living in close contact with leprosy . Although a cumulative 53% protection was observed in the first four years and 81% in the second four years for the vaccine groups combined, there were no significant differences in protection afforded by each of the three vaccines, although it was suggested that immunization with killed M. vaccae alone provided protection. The addition of a preparation of killed M. vaccae to BCG did not enhance the protection afforded over that observed by either vaccine alone. Based on the protection observed in mice and the induction of lepromin reactions in monkeys, M. habana also has been proposed as a leprosy vaccine candidate , . Lepromin reactivity was reportedly augmented in individuals immunized with a live M. habana vaccination in India . Although this result suggested that M. habana immunization stimulated specific cell-mediated immunity against M. leprae and thus indicated vaccine potential, there have been no subsequent reports regarding the protective efficacy of M. habana vaccination. 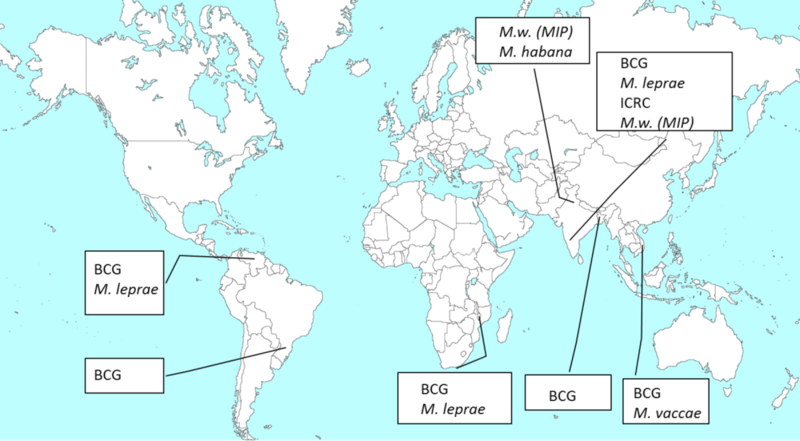 Taken together, several vaccine strategies centered on the use of whole mycobacteria have been attempted; however, to date, none besides BCG have been advanced into common use (Figure 1). Although BCG vaccination has proven to be only partially effective, this important vaccine must be maintained and available for applications in both TB and leprosy, at least for the foreseeable future. As the number of BCG manufacturers continues to diminish, however, supply is becoming a serious issue. The ideal vaccine against leprosy would appear to need to induce strong, long-lasting T-cell responses directed against M. leprae antigens, thereby limiting infection, preventing disease, and, furthermore, reducing bacterial transmission to others. Not until recently has it been practical to contemplate the development and delivery of a new generation of vaccines for leprosy. Key technological and conceptual advances that put this possibility within reach stem from enabling antigen discovery through molecular cloning techniques, most notably aided by the completion and publication of the M. leprae genome . Gene synthesis and antigen production, previously an insurmountable problem when dealing with an organism that had never been cultured in the laboratory, are now achievable at scales appropriate for vaccine development. Of even more critical importance is the recent availability of adjuvants to enable a new generation of T-cell vaccines. Evidence supporting the development of a defined leprosy vaccine came in part from studies showing that immunization with crude antigens preparations derived from the M. leprae cell wall, cell membrane, and cytosol can provide protection , , building on data using whole M. leprae for prophylactic immunization. Although developing usable vaccine from whole cells or fractions thereof is not practical, these earlier studies demonstrated the potential, at least in experimental models, of developing a vaccine against leprosy. An initial step in vaccine development is one of understanding the antigen targets. The 35kD, Ag85B, and hsp65 antigens have all been shown to confer protection against experimental infection when expressed in a DNA vaccine , , . Purified and/or recombinant 10kD, 25kD, and 65kD proteins have also provided protection when administered with incomplete Freund’s adjuvant . Immunization of mice with the Ag85 proteins purified from a BCG culture filtrate with incomplete Freund’s adjuvant provided protection, inhibiting M. leprae growth . In an attempt to make BCG more immunogenic and to extend its protective lifespan, several investigators have genetically refined the bacteria. This refinement has been a major area of interest in the TB field, with several recombinant BCG (rBCG) being produced and advancing toward clinical trial. Only some rBCG have been produced that consider leprosy and the protection that they can afford against leprosy and, therefore, the impact that they could have on leprosy control programs is generally unclear. Ohara and colleagues produced recombinant BCG strains that over-express Ag85 complex components. Immunization of mice with rBCG that over-produce either the A or A/B components reduced the multiplication of M. leprae more than the vaccination with parental BCG , . The provision of multiple doses of rBCG/85A to mice enhanced protection over that observed with a single dose . More recently, an rBCG that secretes M. leprae major membrane protein (MMP)-II (also known as bacterioferritin; ML2038) has been created. This protein was identified as an immunodominant antigen using T-cells from PB leprosy patients . Compared with parental BCG, the rBCG strain (BCG-SM) induces more potent Th1 immune responses ,  and, accordingly, this group recently reported that rBCG-SM inhibits the multiplication of M. leprae in the footpads of challenged mice more efficiently than control BCG . An rBCG overexpressing the M. tuberculosis 30kD antigen, 85B (rBCG30), was previously demonstrated to induce superior protection against both M. tuberculosis and M. bovis challenges in animal models than BCG. Given that Mtb Ag85B is 85% homologous with the M. leprae homolog (r30ML), this vaccine was recently assessed for efficacy against M. leprae challenge in mice . While both BCG and rBCG30 vaccination significantly reduced M. leprae burdens relative to unvaccinated mice, significantly greater protection was induced by rBCG30 against the experimental challenge than by BCG. Thus, in mice, rBCG30, a vaccine that induces improved protection against M. tuberculosis, induces cross-protection against M. leprae. It remains to be determined if this holds true in humans. A potentially prohibitive influence over the use of any live rBCG vaccination is the apparent inability to boost the antigen-specific responses of individuals who have successfully been primed with current BCG strains. rBCG might therefore be best deployed in previously non-BCG immunized populations to prime the immune response, allowing heterologous boosting of the response at a later date if necessary. As an example of this issue, in mice, boosting of rBCG30 responses by vaccinating with the Ag85B protein significantly enhanced r30ML-specific immune responses and augmented protection against M. leprae infection . Over the past decade, we have undertaken an ambitious program to produce and test protein antigens of M. leprae. Dozens of genes were synthesized and expressed recombinantly, the resulting proteins being tested initially for recognition by T-cells from leprosy patients and contacts. Proteins that elicited Th1 responses, predominantly characterized by IFN-g secretion, from PB leprosy patients and HHC of MB patients were considered as vaccine candidates, perhaps being indicative of antigens that naturally limit infection in humans. We considered the broad recognition of candidate proteins by cells of exposed and/or infected individuals from diverse geographical regions to be a critical first step in vaccine antigen selection. Multiple antigens that elicit IFN-g secretion from leprosy patient T-cells have been identified over the last decade and thus are suggested to have potential within a vaccine , . Following antigen selection using patient and contact cells, synthetic genes coding for multiple antigens were produced and proteins expressed. Analogous to the use of whole bacteria, the current state-of-the-art in vaccinology is to simultaneously provide multiple antigen candidates to expand the likelihood that an immunized individual will recognize and respond to at least some of the included epitopes. With the intent to cover as many human leukocyte antigen (HLA) types as possible and to induce a broad range of T-cell responses, genetic information single antigens can be molecularly combined into chimeric fusion proteins. Fusion proteins also can be designed to optimize expression to high levels, even for components that are difficult to produce as single, non-fused proteins. Such multimeric proteins have additional economic and practical appeal through their ability to be expressed and purified as a single product, and we have advanced multi-antigenic chimeric fusion proteins into clinical trials for other disease indications , , , , . However, antigens are not vaccines. To become vaccines, pure, recombinant proteins must be formulated with adjuvants. Thus, before evaluating antigen candidates in animal models, it was of critical importance to define safe and effective vaccine adjuvants that could be practically developed for a leprosy vaccine. Turning antigens into effective immunogens requires an understanding of the nature of the desired immune response(s) and the selection of delivery platforms capable of inducing such a response. A major breakthrough in the development of vaccine candidates against intracellular pathogens such as M. leprae occurred with the identification of adjuvants capable of inducing Th1 responses. Safe and effective adjuvants for prophylactic and therapeutic vaccine use have been developed from the identification and optimizing formulations of small molecules. Effectively engaging macrophages and dendritic cells leading to T-cell responses is essential for developing a new generation of T-cell vaccines. The most advanced approaches to new adjuvant development consist of using formulated TLR ligands (TLRL). Of the TLRL, those engaging TLR4 are the most advanced. The first generation TLR4L was MPL®, which has been incorporated into vaccines by GlaxoSmithKline, most notably Cervarix®. To improve upon this technology and, importantly, to ensure access of adjuvants for neglected disease vaccines, we developed next generation molecules that could build on the extensive safety and efficacy data obtained using MPL. Using the crystal structure of the MD2 molecule of human TLR4, we have designed and optimized a new generation of ligands. Two of these molecules have advanced to clinical studies, with the one used most extensively being GLA , , , . Just as an antigen is not a vaccine, a molecule is generally a non-optimal adjuvant. The manner in which TLRL are formulated dramatically influences the nature of the immune response induced. We have developed and evaluated a variety of formulations of our lead TLR4L, GLA, including oil/water emulsions, micellar, niosomal, and liposomal, in clinical trials and in a variety of preclinical models. When properly formulated, GLA, which was optimized for activity on human cells but is also active in animal models, has the ability to focus the CD4 T-cell profile to a type 1, while down regulating a type 2, response. The drive toward a favorable Th1 response enables protection with vaccine proteins in models of leprosy. To date, most leprosy vaccine trials have been conducted in leprosy hyper-endemic regions and required the recruitment of large numbers of the general public (more than 150,000 in the south India trail). Targeting at-risk individuals with an effective immuno-chemo prophylactic regimen will be an effective approach for preventing disease progression and transmission. Epidemiological data demonstrate that although leprosy cases tend to be clustered in particular regions, they are unevenly distributed throughout communities (see Chapter 1.1). Implementing vaccination in a number of high-endemic regions, and conducting focused surveillance programs within groups of people who assemble in numbers that would permit mass examination, would appear efficient and hopefully aid in developing sustainable programs. From a pragmatic viewpoint, the identification of leprosy cases in any of the assessed individuals would trigger the examination of contacts living in their household. Such early detection and treatment on a community-by-community basis would represent a significant and practical breakthrough in identifying infection, further reducing the number of leprosy cases and interrupting the transmission of new infections. It is conceivable that vaccination programs could be implemented on the basis of known risk factors to preferentially target at-risk individuals. It is well documented that contacts of MB patients have the highest risk of developing leprosy themselves , , , and many trials have indeed centered on contacts of recognized patients as a rudimentary positive selection step to scale down recruitment needs. The selection of close contacts of patients appears to be the most tenable strategy for efficiently conducting clinical trials. The approach of targeting people who already are likely infected with M. leprae is advocated for, and has been used in the form of, chemoprophylaxis. Various chemoprophylaxis trials have demonstrated that preemptive ‘treatment’ can interrupt leprosy transmission and reduce disease prevalence. Although a significant benefit to treating non-diseased individuals has been demonstrated by chemoprophylaxis trials, differing magnitudes and lengths of protection have been reported , , , , , , , , . The limited success of this approach in contacts of MB patients or contacts with high anti-PGL-I levels is that by the time the chemoprophylaxis is given, their bacillary load may be too high to be eliminated by a single dose (or, as in Indonesia, two doses) of rifampin. This outcome reveals a critical limitation of chemoprophylaxis. In addition, drugs can only provide protection in individuals already harboring M. leprae; those infected after the chemoprophylaxis is given have no protection. In many regions where chemoprophylaxis has been provided, new case detection rates return to pre-trial levels over a relatively short period and leprosy persists. By providing a long-lasting immune response, vaccines hold the potential not only to extend the period of protection but also to expand it to uninfected individuals. Vigilance is needed within a post-exposure immunoprophylaxis setting, however, as evidenced by the precipitation of PB leprosy in a small subset of BCG recipients , . Live attenuated or killed mycobacteria vaccines have been generally well tolerated , , , , , ; however, the development of new vaccines should emphasize the safety of both infected and uninfected individuals. Neurological injury is the most salient feature of leprosy pathology. To date, however, the effect of vaccination on M. leprae-associated neuropathy has not been investigated in a controlled system. As the only animal, other than man, to present with nerve damage following an M. leprae infection, the nine-banded armadillo (Dasypus novemcinctus) presents a unique opportunity to examine neuropathy in a controlled and dynamic fashion. The manifestation of leprosy in armadillos (see Chapter 10.2) is strikingly similar to that in humans. Nerve involvement during M. leprae infection of armadillos can be monitored through techniques that have been adapted to permit the assessment of conduction in both hind limbs along the post tibial branch of the sciatic nerve (lying beneath the skin surface between the ankle and knee and innervating the small lumbrical and flexor muscles of each foot). These nerve conduction studies are noninvasive and are ideal for studying the onset and progress of peripheral neuropathy over time in the same animal. Demyelination of axons results in decreased nerve conduction velocity, and loss of axons causes decreased Compound Motor Action Potential (CMAP) . Similar to observations in humans, depressed CMAP amplitude (<0.9mV) is the most common presentation and experimentally inoculated armadillos develop conduction abnormalities, or even total conduction block, by the late stages of M. leprae infection. Most significantly, nearly all of the animals that develop conduction abnormalities also develop extensive nerve involvement during experimental M. leprae infection and can exhibit many of the classic clinical signs, including foot ulcers, skin lesions, and even blindness , , . Marked inflammation can be observed on histopathological inspection of infected armadillo nerves and a functional deficit can be demonstrated in leprotic nerves using electrophysiology , . Importantly, among the unique attributes of experimental infection in armadillos are a known infection status and, relative to humans, a compressed time until disease emergence. With an emphasis on neurological involvement, studies with armadillos will provide critical information for the development of safe post-exposure prophylaxis for leprosy. It is relatively simple to demonstrate that vaccinated individuals have been primed and boosted in terms of antigen-specific immune responses. As previously mentioned, several studies inoculating high BI MB leprosy patients with whole mycobacteria ‘upgrade’ indicate that cellular responses can be induced even in patients that are often considered to have ‘anergic’ anti-M. leprae T-cells. Interpreting the protective efficacy of a vaccine against the M. leprae infection and emerging leprosy cases, however, remains a significant hurdle. The slow development of the disease and the relatively low incidence rates, even in hyper-endemic regions, has meant that studies have relied on long-term follow-up and the comparison of new case detection rates between unvaccinated and vaccinated groups. These conditions pose logistical problems. The response of a patient to any kind of treatment is informative, and the analysis of the response is likely to identify suitable measurements and/or tools with which to expand and expedite trials. Changes in the viable bacterial burden (see Chapter 5.3) are most likely the best indicator of treatment outcome, and skin-slit smears and biopsies have been used to determine the effects on bacterial burden and histological responses in vaccinated patients. These techniques are fairly invasive for the patient, however, and can decrease their willingness to participate. Both methods are heavily reliant on evaluation by an experienced microscopist, and even then skin-slit smears are not particularly sensitive , , , . Skin-slit smears typically involve the collection of interstitial fluid from ear lobes, elbows, and lesions, etc., and may be applied to non-patients. In contrast, biopsies are typically collected from the lesions of patients, not from uninvolved areas of skin. The collection of biopsies from individuals lacking lesions is therefore neither ethically nor practically appropriate. Surrogate endpoints predictive of response could significantly shorten trials and expedite the adoption of new vaccines. The identification of simple biomarkers as correlates of protection or cure has the potential to provide assays to replace or negate the need for invasive procedures. The relative paucity of publications regarding the response of leprosy patients during treatment has hampered this identification somewhat, although more data are becoming available. Implementation of such simple assays would also make vaccine trials more tractable over larger populations. Despite having had a positive effect on leprosy, mass BCG vaccination for the prevention of TB at national levels is often overlooked as an important factor in current leprosy control programs. BCG does not provide complete protection but, by revealing the potential for vaccination, provides a foundation for the development of newer, hopefully more effective vaccines. It is believed that effective immunization will provide a much broader protective window than the estimated two-year protective window provided by chemoprophylaxis alone. Adapting control strategies to provide both chemoprophylaxis for immediate and short-term protection with immunization for longer-term protection has a distinct appeal and could have an immediate impact. Such trials could also provide a gateway for the assessment and, ultimately, the implementation of defined vaccines that are emerging. ^ Moet FJ, Schuring RP, Pahan D, Oskam L, Richardus JH. 2008. The prevalence of previously undiagnosed leprosy in the general population of northwest Bangladesh. PLoS Negl Trop Dis 2(2):e198. ^ Bakker MI, Hatta M, Kwenang A, Klatser PR, Oskam L. 2002. Epidemiology of leprosy on five isolated islands in the Flores Sea, Indonesia. Trop Med Int Health 7(9):780–787. ^ Schreuder PA, Liben DS, Wahjuni S, Van Den Broek J, De Soldenhoff R. 2002. A comparison of Rapid Village Survey and Leprosy Elimination Campaign, detection methods in two districts of East Java, Indonesia, 1997/1998 and 1999/2000. Lepr Rev 73(4):366–375. a, b, c Setia MS, Steinmaus C, Ho CS, Rutherford GW. 2006. The role of BCG in prevention of leprosy: a meta-analysis. Lancet Infect Dis 6(3):162–170. ^ Ridley DS, Jopling WH. 1966. Classification of leprosy according to immunity. A five-group system. Int J Lepr Other Mycobact Dis 34(3):255–273. ^ Browne SG. 1974. Self-healing leprosy: report on 2749 patients. Lepr Rev 45(2):104–111. ^ Ekambaram V, Sithambaram M. 1977. Self-healing in non-lepromatous leprosy in the area of the ELEP Leprosy Control Project Dharmapuri (Tamil Nadu). Lepr India 49(3):387–392. a, b Goulart IM, Bernardes Souza DO, Marques CR, Pimenta VL, Goncalves MA, Goulart LR. 2008. Risk and protective factors for leprosy development determined by epidemiological surveillance of household contacts. Clin Vaccine Immunol 15(1):101–105. ^ Zodpey SP, Bansod BS, Shrikhande SN, Maldhure BR, Kulkarni SW. 1999. Protective effect of Bacillus Calmette Guérin (BCG) against leprosy: a population-based case-control study in Nagpur, India. Lepr Rev 70(3):287–294. ^ Zodpey SP, Ambadekar NN, Thakur A. 2005. Effectiveness of Bacillus Calmette Guérin (BCG) vaccination in the prevention of leprosy: a population-based case-control study in Yavatmal District, India. Public Health 119(3):209–216. ^ Rodrigues LC, Kerr-Pontes LR, Frietas MV, Barreto ML. 2007. Long lasting BCG protection against leprosy. Vaccine 25(39–40):6842–6844. ^ Merle CS, Cunha SS, Rodrigues LC. 2010. BCG vaccination and leprosy protection: review of current evidence and status of BCG in leprosy control. Expert Rev Vaccines 9(2):209–222. ^ Behr MA, Wilson MA, Gill WP, Salamon H, Schoolnik GK, Rane S, Small PM. 1999. Comparative genomics of BCG vaccines by whole-genome DNA microarray. Science 284(5419):1520–1523. ^ Fischer EA, de Vlas SJ, Habbema JD, Richardus JH. 2011. The long-term effect of current and new interventions on the new case detection of leprosy: a modeling study. PLoS Negl Trop Dis 5(9):e1330. a, b Convit J, Sampson C, Zuniga M, Smith PG, Plata J, Silva J, Molina J, Pinardi ME, Bloom BR, Salgado A. 1992. Immunoprophylactic trial with combined Mycobacterium leprae/BCG vaccine against leprosy: preliminary results. Lancet 339(8791):446–450. a, b Karonga Prevention Trial Group. 1996. Randomised controlled trial of single BCG, repeated BCG, or combined BCG and killed Mycobacterium leprae vaccine for prevention of leprosy and tuberculosis in Malawi. Lancet 348(9019):17–24. ^ WHO. 1995. Global tuberculosis programme and global programme on vaccines. Statement on BCG revaccination for the prevention of tuberculosis. Wkly Epidemiol Rec 70(32):229–231. ^ Rodrigues LC, Pereira SM, Cunha SS, Genser B, Ichihara MY, de Brito SC, Hijjar MA, Dourado I, Cruz AA, Sant’Anna C, Bierrenbach AL, Barreto ML. 2005. Effect of BCG revaccination on incidence of tuberculosis in school-aged children in Brazil: the BCG-REVAC cluster-randomised trial. Lancet 366(9493):1290–1295. ^ Barreto ML, Pereira SM, Ferreira AA. 2006. BCG vaccine: efficacy and indications for vaccination and revaccination. J Pediatr (Rio J) 82(3 Suppl):S45–54. a, b Duppre NC, Camacho LA, Sales AM, Illarramendi X, Nery JA, Sampaio EP, Sarno EN, Buhrer-Sekula S. 2012. Impact of PGL-I seropositivity on the protective effect of BCG vaccination among leprosy contacts: a cohort study. PLoS Negl Trop Dis 6(6):e1711. a, b Richardus RA, Butlin CR, Alam K, Kundu K, Geluk A, Richardus JH. 2015. Clinical manifestations of leprosy after BCG vaccination: an observational study in Bangladesh. Vaccine 33(13):1562–1567. ^ Duppre NC, Camacho LA, da Cunha SS, Struchiner CJ, Sales AM, Nery JA, Sarno EN. 2008. Effectiveness of BCG vaccination among leprosy contacts: a cohort study. Trans R Soc Trop Med Hyg 102(7):631–638. a, b Cunha SS, Alexander N, Barreto ML, Pereira ES, Dourado I, de Fatima Maroja M, Ichihara Y, Brito S, Pereira S, Rodrigues LC. 2008. BCG revaccination does not protect against leprosy in the Brazilian Amazon: a cluster randomised trial. PLoS Negl Trop Dis 2(2):e167. a, b van Brakel W, Cross H, Declercq E, Deepak S, Lockwood D, Saunderson P, Smith WC, Batty J, Nahodilova L, Soutar D, Augustine V, Ebenso B, ILEP Technical Commission. 2010. Review of leprosy research evidence (2002–2009) and implications for current policy and practice. Lepr Rev 81(3):228–275. a, b, c Gupte MD, Vallishayee RS, Anantharaman DS, Nagaraju B, Sreevatsa, Balasubramanyam S, de Britto RL, Elango N, Uthayakumaran N, Mahalingam VN, Lourdusamy G, Ramalingam A, Kannan S, Arokiasamy J. 1998. Comparative leprosy vaccine trial in south India. Indian J Lepr 70(4):369–388. ^ Sreevatsa, Desikan KV. 1988. Evaluation of the efficacy of candidate vaccines against M. leprae infection in mice. Indian J Lepr 60(2):252–259. ^ Bhide MB, Pradhan KS, Bapat CV. 1978. A vaccine from ICRC bacilli against M. leprae infection in mouse foot-pad. Lepr India 50(3):334–344. ^ Sharma P, Mukherjee R, Talwar GP, Sarathchandra KG, Walia R, Parida SK, Pandey RM, Rani R, Kar H, Mukherjee A, Katoch K, Benara SK, Singh T, Singh P. 2005. Immunoprophylactic effects of the anti-leprosy Mw vaccine in household contacts of leprosy patients: clinical field trials with a follow up of 8–10 years. Lepr Rev 76(2):127–143. ^ Vallishayee RS, Gupte MD, Anantharaman DS, Nagaraju B. 1996. Post-vaccination sensitization with ICRC vaccine. Indian J Lepr 68(2):167–174. ^ Truoc LV, Ly HM, Thuy NK, Trach DD, Stanford CA, Stanford JL. 2001. Vaccination against leprosy at Ben San Leprosy Centre, Ho Chi Minh City, Vietnam. Vaccine 19(25–26):3451–3458. ^ Singh NB, Lowe AC, Rees RJ, Colston MJ. 1989. Vaccination of mice against Mycobacterium leprae infection. Infect Immun 57(2):653–655. ^ Singh NB, Srivastava A, Gupta HP, Kumar A, Srivastava S. 1991. Induction of lepromin positivity in monkeys by a candidate antileprosy vaccine: Mycobacterium habana. Int J Lepr Other Mycobact Dis 59(2):317–320. a, b Wakhlu A, Gaur SP, Kaushal GP, Misra A, Asthana P, Sircar AR. 2001. Response of Mycobacterium habana vaccine in patients with lepromatous leprosy and their household contacts. A pilot clinical study. Lepr Rev 72(2):179–191. ^ Cole ST, Eiglmeier K, Parkhill J, James KD, Thomson NR, Wheeler PR, Honoré N, Garnier T, Churcher C, Harris D, Mungall K, Basham D, Brown D, Chillingworth T, Connor R, Davies RM, Devlin K, Duthoy S, Feltwell T, Fraser A, Hamlin N, Holroyd S, Hornsby T, Jagels K, Lacroix C, Maclean J, Moule S, Murphy L, Oliver K, Quail MA, Rajandream MA, Rutherford KM, Rutter S, Seeger K, Simon S, Simmonds M, Skelton J, Squares R, Squares S, Stevens K, Taylor K, Whitehead S, Woodward JR, Barrell BG. 2001. Massive gene decay in the leprosy bacillus. Nature 409(6823):1007–1011. ^ Gelber RH, Brennan PJ, Hunter SW, Munn MW, Monson JM, Murray LP, Siu P, Tsang M, Engleman EG, Mohagheghpour N. 1990. Effective vaccination of mice against leprosy bacilli with subunits of Mycobacterium leprae. Infect Immun 58(3):711–718. ^ Ngamying M, Sawanpanyalert P, Butraporn R, Nikasri J, Cho SN, Levy L, Brennan PJ. 2003. Effect of vaccination with refined components of the organism on infection of mice with Mycobacterium leprae. Infect Immun 71(3):1596–1598. ^ Britton WJ, Martin E, Kamath AT, Neupane KD, Roche PW. 2000. Immunoprophylaxis against Mycobacterium leprae infection with subunit vaccines. Lepr Rev 71(Suppl):S176–181. ^ Roche PW, Neupane KD, Failbus SS, Kamath A, Britton WJ. 2001. Vaccination with DNA of the Mycobacterium tuberculosis 85B antigen protects mouse foot pad against infection with M. leprae. Int J Lepr Other Mycobact Dis 69(2):93–98. ^ Nomaguchi H, Mukai T, Takeshita F, Matsuoka M, Maeda Y, Aye TM, Jahan N, Yogi Y, Endo M, Sato Y. 2002. Effect of hsp65 DNA vaccination carrying immunostimulatory DNA sequences (CpG motifs) against Mycobacterium leprae multiplication in mice. Int J Lepr Other Mycobact Dis 70(3):182–190. ^ Gelber RH, Mehra V, Bloom B, Murray LP, Siu P, Tsang M, Brennan PJ. 1994. Vaccination with pure Mycobacterium leprae proteins inhibits M. leprae multiplication in mouse footpads. Infect Immun 62(10):4250–4255. ^ Naito M, Matsuoka M, Ohara N, Nomaguchi H, Yamada T. 1999. The antigen 85 complex vaccine against experimental Mycobacterium leprae infection in mice. Vaccine 18(9–10):795–798. a, b Ohara N, Matsuoka M, Nomaguchi H, Naito M, Yamada T. 2000. Inhibition of multiplication of Mycobacterium leprae in mouse foot pads by recombinant Bacillus Catmette-Guérin (BCG). Vaccine 18(14):1294–1297. ^ Ohara N, Matsuoka M, Nomaguchi H, Naito M, Yamada T. 2001. Protective responses against experimental Mycobacterium leprae infection in mice induced by recombinant Bacillus Calmette-Guérin over-producing three putative protective antigen candidates. Vaccine 19(15–16):1906–1910. ^ Maeda Y, Mukai T, Spencer J, Makino M. 2005. Identification of an immunomodulating agent from Mycobacterium leprae. Infect Immun 73(5):2744–2750. ^ Makino M, Maeda Y, Ishii N. 2005. Immunostimulatory activity of major membrane protein-II from Mycobacterium leprae. Cell Immunol 233(1):53–60. ^ Makino M, Maeda Y, Inagaki K. 2006. Immunostimulatory activity of recombinant Mycobacterium bovis BCG that secretes major membrane protein II of Mycobacterium leprae. Infect Immun 74(11):6264–6271. ^ Maeda Y, Tamura T, Matsuoka M, Makino M. 2009. Inhibition of the multiplication of Mycobacterium leprae by vaccination with a recombinant BCG that secretes major membrane protein-II in mice. Clin Vaccine Immunol 16(10):1399–1404. a, b Gillis TP, Tullius MV, Horwitz MA. 2014. rBCG30-induced immunity and cross-protection against Mycobacterium leprae challenge are enhanced by boosting with the Mycobacterium tuberculosis 30-kilodalton antigen 85B. Infect Immun 82(9):3900–3909. ^ Duthie MS, Reece ST, Lahiri R, Goto W, Raman VS, Kaplan J, Ireton GC, Bertholet S, Gillis TP, Krahenbuhl JL, Reed SG. 2007. Antigen-specific cellular and humoral responses are induced by intradermal Mycobacterium leprae infection of the mouse ear. Infect Immun 75(11):5290–5297. ^ Duthie MS, Goto W, Ireton GC, Reece ST, Sampaio LH, Grassi AB, Sousa AL, Martelli CM, Stefani MM, Reed SG. 2008. Antigen-specific T-cell responses of leprosy patients. Clin Vaccine Immunol 15(11):1659–1665. ^ Montoya J, Solon JA, Cunanan SR, Acosta L, Bollaerts A, Moris P, Janssens M, Jongert E, Demoitié MA, Mettens P, Gatchalian S, Vinals C, Cohen J, Ofori-Anyinam O. 2013. A randomized, controlled dose-finding phase II study of the M72/AS01 candidate tuberculosis vaccine in healthy PPD-positive adults. J Clin Immunol 33(8):1360–1375. ^ Van Braeckel E, Desombere I, Clement F, Vandekerckhove L, Verhofstede C, Vogelaers D, Leroux-Roels G. 2013. Polyfunctional CD4(+) T cell responses in HIV-1-infected viral controllers compared with those in healthy recipients of an adjuvanted polyprotein HIV-1 vaccine. Vaccine 31(36):3739–3746. ^ Taylor DN, Treanor JJ, Sheldon EA, Johnson C, Umlauf S, Song L, Kavita U, Liu G, Tussey L, Ozer K, Hofstaetter T, Shaw A. 2012. Development of VAX128, a recombinant hemagglutinin (HA) influenza-flagellin fusion vaccine with improved safety and immune response. Vaccine 30(39):5761–5769. ^ van Dissel JT, Soonawala D, Joosten SA, Prins C, Arend SM, Bang P, Tingskov PN, Lingnau K, Nouta J, Hoff ST, Rosenkrands I, Kromann I, Ottenhoff TH, Doherty TM, Andersen P. 2011. Ag85B-ESAT-6 adjuvanted with IC31(R) promotes strong and long-lived Mycobacterium tuberculosis specific T cell responses in volunteers with previous BCG vaccination or tuberculosis infection. Vaccine 29(11):2100–2109. ^ Esen M, Kremsner PG, Schleucher R, Gässler M, Imoukhuede EB, Imbault N, Leroy O, Jepsen S, Knudsen BW, Schumm M, Knobloch J, Theisen M, Mordmüller B. 2009. Safety and immunogenicity of GMZ2 – a MSP3-GLURP fusion protein malaria vaccine candidate. Vaccine 27(49):6862–6868. ^ Coler RN, Bertholet S, Moutaftsi M, Guderian JA, Windish HP, Baldwin SL, Laughlin EM, Duthie MS, Fox CB, Carter D, Friede M, Vedvick TS, Reed SG. 2011. Development and characterization of synthetic glucopyranosyl lipid adjuvant system as a vaccine adjuvant. PLoS One 6(1):e16333. ^ Coler RN, Duthie MS, Hofmeyer KA, Guderian J, Jayashankar L, Vergara J, Rolf T, Misquith A, Laurance JD, Raman VS, Bailor HR, Cauwelaert ND, Reed SJ, Vallur A, Favila M, Orr MT, Ashman J, Ghosh P, Mondal D, Reed SG. 2015. From mouse to man: safety, immunogenicity and efficacy of a candidate leishmaniasis vaccine LEISH-F3+GLA-SE. Clin Transl Immunology 4(4):e35. ^ Santini-Oliveira M, Coler RN, Parra J, Veloso V, Jayashankar L, Pinto PM, Ciol MA, Bergquist R, Reed SG, Tendler M. 2016. Schistosomiasis vaccine candidate Sm14/GLA-SE: Phase 1 safety and immunogenicity clinical trial in healthy, male adults. Vaccine 34(4):586–594. ^ Knudsen NP, Olsen A, Buonsanti C, Follmann F, Zhang Y, Coler RN, Fox CB, Meinke A, U DO, Casini D, Bonci A, Billeskov R, de Gregorio E, Rappuoli R, Harandi AM, Andersen P, Agger EM. 2016. Different human vaccine adjuvants promote distinct antigen-independent immunological signatures tailored to different pathogens. Sci Rep 6:19570. ^ Bakker MI, Hatta M, Kwenang A, Van Mosseveld P, Faber WR, Klatser PR, Oskam L. 2006. Risk factors for developing leprosy—a population-based cohort study in Indonesia. Lepr Rev 77(1):48–61. ^ Moet FJ, Pahan D, Schuring RP, Oskam L, Richardus JH. 2006. Physical distance, genetic relationship, age, and leprosy classification are independent risk factors for leprosy in contacts of patients with leprosy. J Infect Dis 193(3):346–353. ^ Bakker MI, Hatta M, Kwenang A, Van Benthem BH, Van Beers SM, Klatser PR, Oskam L. 2005. Prevention of leprosy using rifampicin as chemoprophylaxis. Am J Trop Med Hyg 72(4):443–448. ^ Smith WCS. 2008. Chemoprophylaxis in the prevention of leprosy. BMJ 336(7647):730–731. ^ Moet FJ, Oskam L, Faber R, Pahan D, Richardus JH. 2004. A study on transmission and a trial of chemoprophylaxis in contacts of leprosy patients: design, methodology and recruitment findings of COLEP. Lepr Rev 75(4):376–388. ^ Vijayakumaran P, Krishnamurthy P, Rao P, Declerq E. 2000. Chemoprophylaxis against leprosy: expectations and methodology of a trial. Lepr Rev 71(Suppl):S37–40; discussion S40–31. ^ Nguyen LN, Cartel JL, Grosset JH. 2000. Chemoprophylaxis of leprosy in the southern Marquesas with a single 25 mg/kg dose of rifampicin. Results after 10 years. Lepr Rev 71(Suppl):S33–35; discussion S35–36. ^ Diletto C, Blanc L, Levy L. 2000. Leprosy chemoprophylaxis in Micronesia. Lepr Rev 71(Suppl):S21–23; discussion S24–25. ^ Smith CM, Smith WC. 2000. Chemoprophylaxis is effective in the prevention of leprosy in endemic countries: a systematic review and meta-analysis. MILEP2 Study Group. Mucosal Immunology of Leprosy. J Infect 41(2):137–142. ^ Tin K. 1999. Population screening and chemoprophylaxis for household contacts of leprosy patients in the Republic of the Marshall Islands. Int J Lepr Other Mycobact Dis 67(4 Suppl):S26–29. ^ Daulako EC. 1999. Population screening and mass chemoprophylaxis in Kiribati. Int J Lepr Other Mycobact Dis 67(4 Suppl):S23–25. ^ Talwar GP, Zaheer SA, Mukherjee R, Walia R, Misra RS, Sharma AK, Kar HK, Mukherjee A, Parida SK, Suresh NR, Nair SK, Pandey RM. 1990. Immunotherapeutic effects of a vaccine based on a saprophytic cultivable mycobacterium, Mycobacterium w in multibacillary leprosy patients. Vaccine 8(2):121–129. ^ Katoch K, Katoch VM, Natrajan M, Sreevatsa, Gupta UD, Sharma VD, Shivanavar CT. 2004. 10–12 years follow-up of highly bacillated BL/LL leprosy patients on combined chemotherapy and immunotherapy. Vaccine 22(27–28):3649–3657. ^ Narang T, Kaur I, Kumar B, Radotra BD, Dogra S. 2005. Comparative evaluation of immunotherapeutic efficacy of BCG and mw vaccines in patients of borderline lepromatous and lepromatous leprosy. Int J Lepr Other Mycobact Dis 73(2):105–114. ^ Wilkinson RJ, Lockwood DN. 2005. Antigenic trigger for type 1 reaction in leprosy. J Infect 50(3):242–243. ^ Zaheer SA, Mukherjee R, Ramkumar B, Misra RS, Sharma AK, Kar HK, Kaur H, Nair S, Mukherjee A, Talwar GP. 1993. Combined multidrug and Mycobacterium w vaccine therapy in patients with multibacillary leprosy. J Infect Dis 167(2):401–410. ^ Franssen H. 2008. Electrophysiology in demyelinating polyneuropathies. Expert Rev Neurother 8(3):417–431. ^ Loughry WJ, Truman RW, McDonough CM, Tilak MK, Garnier S, Delsuc F. 2009. Is leprosy spreading among nine-banded armadillos in the southeastern United States? J Wildl Dis 45(1):144–152. ^ Storrs EE, Walsh GP, Burchfield HP, Binford CH. 1974. Leprosy in the armadillo: new model for biomedical research. Science 183(127):851–852. ^ Scollard DM. 2008. The biology of nerve injury in leprosy. Lepr Rev 79(3):242–253. ^ Banerjee S, Biswas N, Kanti Das N, Sil A, Ghosh P, Hasanoor Raja AH, Dasgupta S, Kanti Datta P, Bhattacharya B. 2011. Diagnosing leprosy: revisiting the role of the slit-skin smear with critical analysis of the applicability of polymerase chain reaction in diagnosis. Int J Dermatol 50(12):1522–1527. ^ Contin LA, Alves CJ, Fogagnolo L, Nassif PW, Barreto JA, Lauris JR, Nogueira ME. 2011. Use of the ML-Flow test as a tool in classifying and treating leprosy. An Bras Dermatol 86(1):91–95. ^ Kamal R, Natrajan M, Katoch K, Katoch VM. 2010. Evaluation of diagnostic role of in situ PCR on slit-skin smears in pediatric leprosy. Indian J Lepr 82(4):195–200. ^ Bhushan P, Sardana K, Koranne RV, Choudhary M, Manjul P. 2008. Diagnosing multibacillary leprosy: a comparative evaluation of diagnostic accuracy of slit-skin smear, bacterial index of granuloma and WHO operational classification. Indian J Dermatol Venereol Leprol 74(4):322–326.